Fresh ground pepper and sea salt to taste. After soaking the beans overnight, strain and rinse. In a large stockpot heat 1/4 cup UP Picholine over medium heat. Add the onion, and red pepper and saute for about two minutes before adding the minced garlic. Saute the garlic for another minute. Add the stock to the pot along with soaked and drained beans. Simmer on medium low, uncovered for about an hour until the beans are tender. Meanwhile, preheat the oven to 400 F. Cut the bread in to 1″ slices and brush liberally with remaining 1/4 cup of UP Picholine. Toast the bread slices, oiled side up in a single layer on a baking sheet placed in the top rack of the oven for 12 minutes, or until golden brown. Cut the whole clove of garlic in half, and rub the toasted bread slices with the cut side of the garlic clove and set aside. 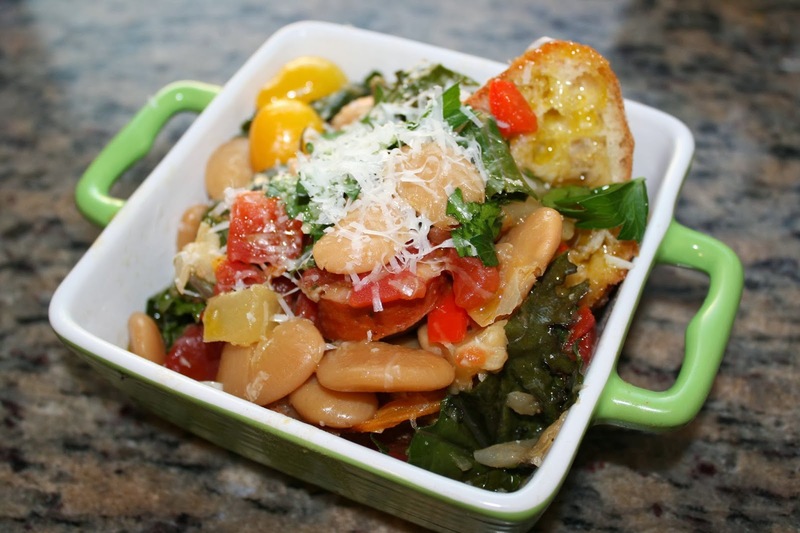 When the beans are almost tender, after about an hour of cooking, add the tomato and kale to the pot. Simmer for an additional 20 minutes, then add the zucchini and basil and simmer for an additional 5 minutes. Place one toasted slice of bread in each bowl. Ladle the hot ribollita over the toasted bread. Finish each bowl with a drizzle of Gremolata Infused Olive Oil and a sprinkle of Pecorino Romano and a pinch of flat leaf parsley.